I remember preaching a message years ago in which I talked about the Bible’s use of the word authority. 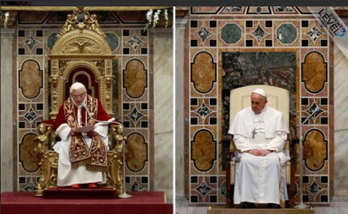 Now for Catholics, authority rests in a man who speaks ex cathedra… from the chair. For those who rule us politically their authority can be described as ex officio… out of the office they hold. But for the believer in Jesus, the authority that He grants us is based on our relationship with Him. The word translated authority in the Greek is exousia. It is a derivative of the verb “to be” It can be rendered ‘Out of who I AM’. 1. Francis X. Rocca, “Shifting lines: Pope’s Uncertainty Principle,” The Wall Street Journal, March 31-April 1, 2018, p. A9. 6. Everett Piper, The Wrong Side of the Door, p. 23. This entry was posted in Biblical Lesson/Teaching, Biblical Theme/Topic, Biblical Theology/Doctrine on April 5, 2018 by Truth2Freedom.